The Security and Exchange Commission announced the 15 SB awardees of the $2.5 Billion ONE OIT information technology bid in October but just one month later they announced that they are going to issue the on-ramp opportunity for the same SB pool, even as early as the end of November. So what should your strategy be? Should you take part? Is it worth the time and energy, especially since these self-scoring proposals, are extremely time-consuming? I will try to give some insights into these questions in this and future articles on the ONE OIT. These beasts are here to stay. More and more agencies are using them. They are extremely time consuming and need extreme attention to the details or you will be disqualified for being found non-compliant. For HCaTS which is the GSA’s educational GWAC and based on self-scoring, nearly 75% of the SB bids and 50% of the unrestricted bids were disqualified for being non-compliant. Unfortunately, the traditionally based proposal managers are very uncomfortable with the way this new system works and that is why we are seeing a rising trend of companies outsourcing self-scoring proposal to specialists. 2- Are all self-scoring proposals similar? Not at all. Some are pure self-scoring, like OASIS, VETTS II, or Alliant and some are a hybrid like the USAF SBEAS. For those that are pure self-scoring, again the requirements and the emphasis is completely different. Take the case of OASIS where the driving factor for picking your selected contracts is the past performance score. If you have an “exceptional” rated past performance for a small value contract, it will certainly get a higher score than a very large multi-million dollar project that has a “very good” rating score past performance. On the contrary, the SEC ONE OIT puts its emphasis on experience. So you get a little less than 3 times the score for experience in different fields than you get for past performance. So when assessing your armament, you must consider that. Your strategy, if you are going after SEC ONE OIT, should be completely different from your strategy if you are going after the upcoming OASIS Pool 3 or 8(a) Pools. Unlike many of the original RFPs for these self-scoring opportunities, GSA and other agencies are now allowing subcontracting. SEC ONE OIT SB pool allowed it from the beginning. This is extremely important and should be a pivotal part of your attack strategy. You need to assess your weaknesses and see how you can bring in outside help; that is, use your subcontractor(s)’ projects to boost your score. Everybody else is going to do it so don’t try to go solo unless you have an extremely strong case – which you should always be doubtful about – or you just don’t have the resources to resolve the logistics of partnering. Partnering could be in the form of Prime/Sub relationship as well as JVs. Per my experience, Prime/Sub relationships can go much smoother and can, in fact, create much better scoring as well. Of course, if you do have a JV in place already, that is another story. In OASIS, you need to substantiate that you cover a subset of 6 “Core Disciplines” for each contract (a total of 5 contracts). In SEC ONE OIT, you need to substantiate for around 115 items in 17 total contracts. So preparation of the SEC ONE OIT is certainly much more time consuming that OASIS or those like Alliant II or VETTS II. Again another reason that you should get outside help, even if it is merely audit/reviewing your in-house work. This by itself tells you that that Experience and Risk Management take 77% of the scoring so that is where your strategy should focus. 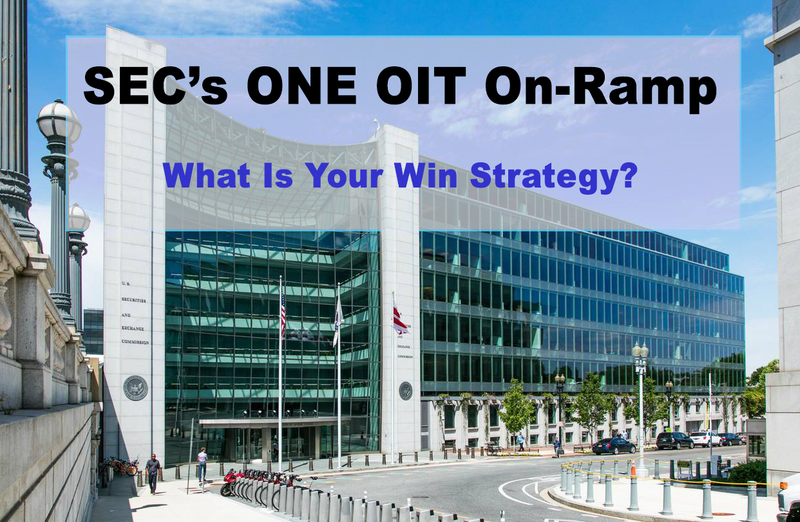 And BTW, I will be holding a webinar on the SEC ONE OIT to discuss these issues in more detail and answer questions. I will provide the exact date and time in future posts. Ab Vand has more than 25 years of proposal writing and capture management experience on government contracts especially in defense, construction, and IT sectors. Ab has a track record of writing over 100 successful proposals for above $1 million contracts. Ab is currently the VP of Capture and Proposal Development at GDI Consulting, a well-established firm on proposal writing and contract management. Ab has written a number of articles on proposal writing and capture management, and regularly holds training courses for companies and individuals on ways to improve their winning chances.